For years, the only and most effective way to clean floors was to use the “old fashioned” mop and bucket. In fact, this method is still widely used today although it is not the most efficient nor the most sanitary. There are some negative aspects to consider when cleaning with a mop and bucket. First and foremost, the cleaning solution is quickly contaminated as the mop comes in contact with the dirty floor and keeps getting submerged back into the cleaning solution. Before long, dirty water is just being spread over the floor. Additionally, mopping cannot clean the grout in tiled floors and baseboards tend to gather dirt from the mops. Mopping tends to “wipe” as it cleans without providing any real pressure to deep clean the surface and mopping large areas is very time-consuming. Realizing all of the pitfalls associated with mopping, most businesses have turned to the automatic floor scrubber. 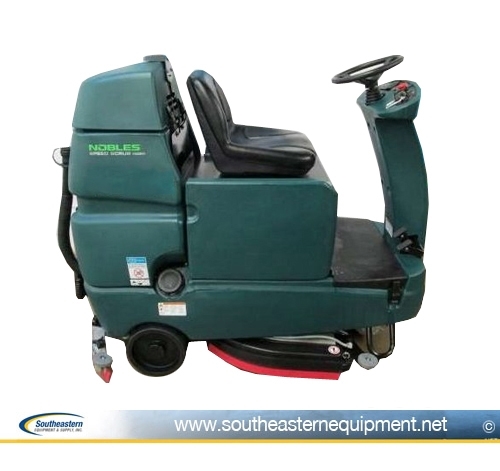 The automatic scrubber is an excellent way to clean effectively and efficiently. What is the basic concept of an automatic scrubber? How does it work? To ensure that clean water is always being delivered to the floor, 2 tanks are used, one for clean water and one for dirty water. The solution system delivers the clean water with the solution and the scrubbing system cleans the floor. After the floor is scrubbed, the recovery system comes into play. A squeegee collects all of the dirty water and then in is vacuumed into the recovery tank. How are scrubbers powered? They are powered either by battery, corded electric or engine. The engine scrubbers are reserved for large industrial rider machines and use liquid propane, gasoline, or diesel. When choosing the right scrubber, a few factors need to be taken into consideration. If you have a large area to be cleaned and are using a small scrubber, you will end up spending more time and money in labor over a long period of time. Here is a chart that can help you decide what size scrubber to acquire. These numbers may vary depending on the manufacturer of your machine. Size of Scrubber | Realistic Sq. Ft. per Hour | Minutes per 1000 Sq. Ft. The solution system is key to providing the cleaning solution to the floor. The solution tank holds the water and chemicals which are delivered via either a gravity feed or pump feed. This ensures that dirty water never contaminates the cleaning solution. There are a few types of scrubbing systems to consider depending on your needs. Cylindrical Scrubbing-The cylindrical brush is going to be better on your grouted, rough and uneven floors but more expensive. Pre-sweeping is usually not necessary if you are using a cylindrical scrubber as it also performs "light sweeping" due to its design. 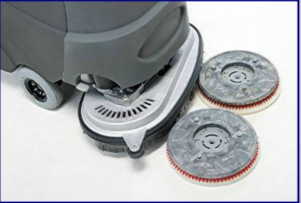 Disc Scrubbing-The disc style machine is better suited for smooth floors and has more down pressure than a cylindrical style machine. Also, pads or brushes can be used depending on your needs. Pads clean smooth floors better than brushes and there are a wide variety of pads available depending on how aggressive you want clean the floor. However, they are not as "green" as brushes because they have to be replaced regularly. With that in mind, brushes may be a better value than pads depending on the type of floor that you are cleaning. After the solution system delivers the water and chemicals and the scrubbing system loosens the dirt from the floor, the recovery system retrieves that dirty water. The rear squeegee collects and wipes the water and provides a seal for the vacuum to remove the dirty water. The type of squeegee you choose depends on what you are cleaning. The most economical option is gum rubber; it provides good performance on smooth floors but will wear quickly on rough floors due to its soft compound. Linatex is a good option if you are cleaning a floor which has a high concentration of petroleum base dirt, such as a factory. Polyurethane will be your most expensive option mainly because it has the best abrasion resistance. There are 3 different types of propulsion on a modern day automatic scrubbers. Micro-scrubbers use manual propulsion. Smaller scrubbers use pad or brush assist propulsion. 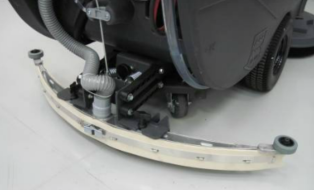 The pad or brush assists the machine along the floor. Traction drive propulsion is used on small to rider scrubbers to effortlessly move the machine. What are the types of scrubbers available? Walk-behind scrubbers come in a variety of sizes. 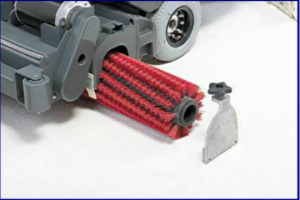 Micro-scrubbers with a cleaning path of 17 inches or smaller are great for small areas. Then there are the large, 26 inch plus, scrubbers that can cover large areas quickly. These scrubbers have high productivity in mind. Rider scrubbers will normally have a 24 inch or larger cleaning path with large recovery tanks. These machines will be battery powered and need to have a dedicated charging/storage area. They are relatively easy to use and can clean large areas very fast. Relatively new on the scene is chemical-free scrubbing. In these days, every effort is being made to be environmentally friendly. While all chemicals are not bad for the environment, it’s been found that going “green” can also save money! For example, Orbio’s ec-H2O technology electrically converts water into a cleaning solution. Testing has shown that this method effectively removes soil while significantly improving floor traction. No more chemicals mean fewer accidents and greater productivity. Scrubbers with this technology can clean up to three times longer on a single tank. 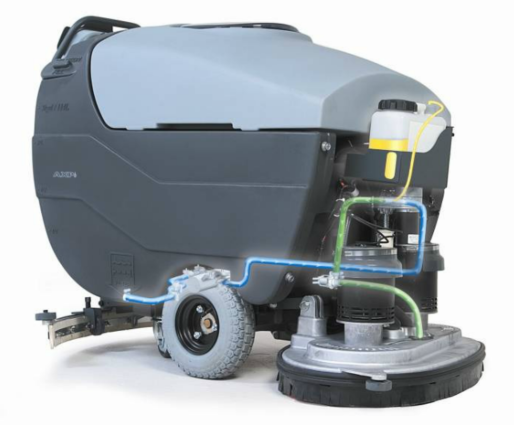 There are many factors to consider when buying an automatic scrubber. 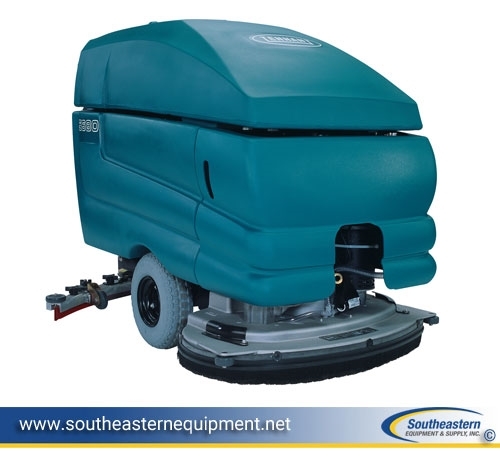 Adding a scrubber to your cleaning arsenal will greatly increase your floor appearance, sanitation, and productivity. With any machine, be sure to provide proper training to your operators as well as follow a well-planned maintenance schedule. This will ensure you get the most out of your scrubber. If you have additional questions or still need more information, feel free to contact us and speak to one of our experts to assist you in choosing the right piece of equipment to suit your needs.